Do You Remember WWE's Greatest Tag Teams Of All Time? Do You Remember WWE’s Greatest Tag Teams Of All Time? Keep reading to see where you’re favorite tag team ended up! 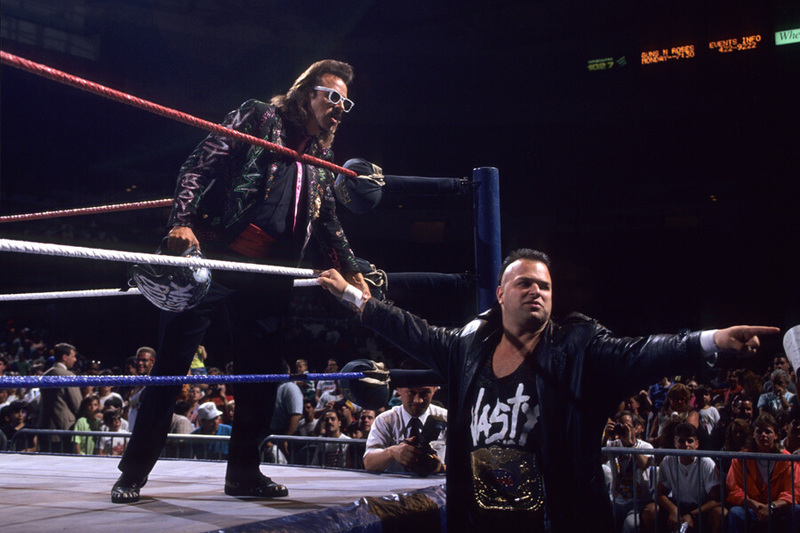 The Hart Foundation was headlined by brothers-in-law Bret “Hit Man” Hart and Jim “The Anvil” Neidhart. Together, they proudly entered the ring in pink and black, ready to show anyone who dared fight them how devastating they could be. Today, they are looked at as the gold standard for WWE tag teams. The Hart Foundation’s WWE dominance began with a lengthy Championship run in 1987. They followed that act with another lengthy run in 1990. Along the way they took down highly touted teams like The British Bulldogs, The Rockers, and Demolition. Sure, they lost every once in a while, but that just made angry and hungry for the next battle. The Road Warriors were inducted into the WWE Hall of Fame in 2011, eight years after the tragic death of Road Warrior Hawk. He was 46 years old and still lives on in the hearts of millions of WWE fans worldwide. Together with Road Warrior Animal, the tag team destroyed the AWA, WCW, NWA, and WWE. Weighing a combined 575 pounds, the Road Warriors were the last opponents anyone wanted to face in the ring. They won their first WWE Title in 1991 at SummerSlam. In 1992, they left the organization, returning five years later to take back what was rightfully theirs. Coming up next, the Hardy Boyz make WWE history with the first TLC match. Wrestling is an intense sport and takes timing a precision to perform without getting seriously hurt. The Hardy Boyz entered WWE at the end of the “Attitude Era” and threw all safety guidelines out the window. 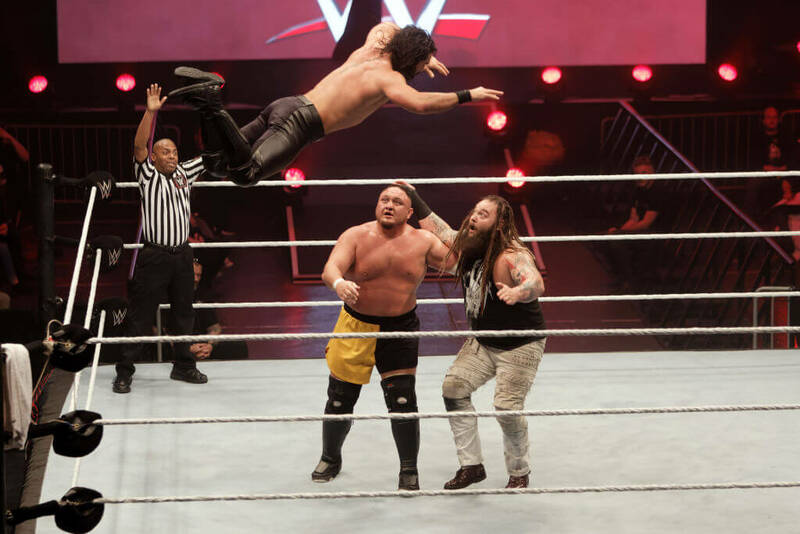 Their success hinged on their ability to perform as a high-wire (and high-wired) wrestling act who didn’t care if they got hurt as long as they hurt their opponent more. One of the Hardy Boyz nastiest contributions to the sport was introduction of the Tables, Ladders, and Chairs Match (TLC). Together with The Dudley Boyz and Edge and Christian, the WWE had it’s inaugural three-way, tag-team, TLC match with them in 2000 at SummerSlam. We couldn’t talk about the Hardy Boyz without having the Dudley Boyz next on this list. The Hardy’s long-time rivals, the Dudley Boyz, ended their wrestling career with 23 Championship across several promotions. In 2018, they were inducted into the WWE Hall of Fame by Edge and Christian. As they were placed into WWE history, Bubba Dudley said this, “I don’t think you will ever see a tag team go on to accomplish what we have accomplished, whether that’s in the WWE or any place else. We really are the last of many, many generations of great tag teams.” Only time will tell. Next, do you think Demolition deserves to be so high on this list? Billed as cheap clones of The Road Warriors by WWE fans when they entered the league, Demolition didn’t waste time proving they were there own unstoppable force. Ax and Smash made up the team, weighed a combined 580 pounds, and used every ounce of it to capture three tag team championships. Eventually, Crush (pictured above) joined the team. They held their three titles for a 698 total days, including a legendary 470 day long run with their second. Today, the team is waiting for their spot in the WWE Hall of Fame. This is a spot that is a certainty considering their legendary career. Named by WWE in 2012 as its greatest tag team ever, Edge and Christian won seven tag team championships over their storied career. Growing up together in Toronto, Canada, they proved our friends from the North don’t always play nice with others. In 2000, Edge and Christian defeated the Hardy Boyz and the Dudley Boyz to win the first ever TLC match. One year later they defended their title at Wrestlemania. The epic title defense is considered by many to be the greatest tag team match in league history. 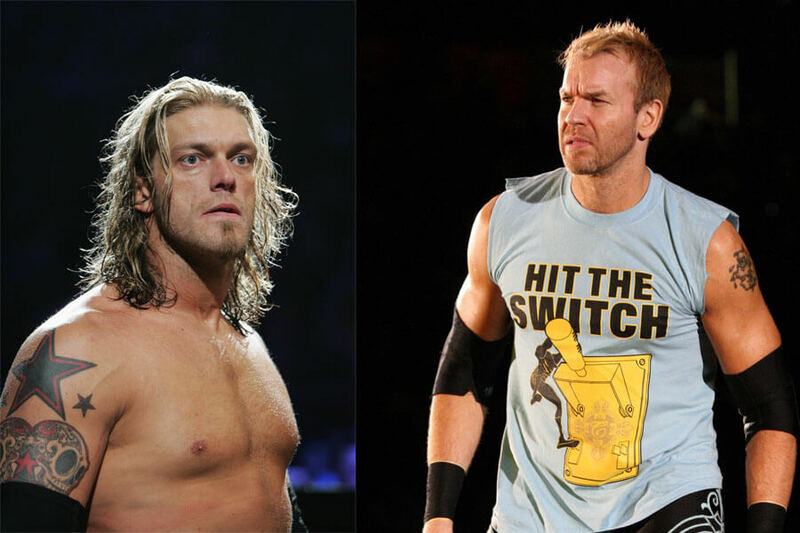 Edge retired from the sport in 2011, citing several neck injuries and putting an end to the tag team duo in the ring. Formed in 1997 by Road Dogg and Billy Gunn, the New Age Outlaws blazed a quick path through the WWE that left a mark on the sport forever. The pair formed as struggling superstars needed new gimmicks and decided to end their longstanding feud and team up. That same year they expanded, joining D-Generation X to form of the greatest WWE teams of all-time. Three years after taking WWE by storm and becoming one of the league’s most hated heels, the New Age Outlaws split up. They came, they saw, they conquered, and they disbanded. 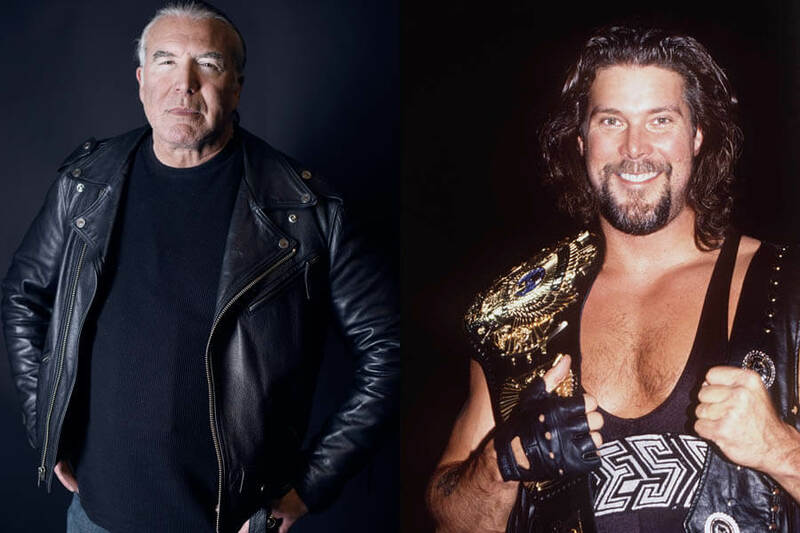 Scott Hall and Kevin Nash formed the Outsiders in 1996 and began the New World Order (NWO) shortly after to take over the WCW. Both wrestlers stood almost seven feet tall and weighed 300 pounds, creating a deadly combination that eventually found its way into the WWE. While in the WCW, the Outsiders won six tag team championships. When they got their chance to terrorize the WWE they didn’t disappoint. 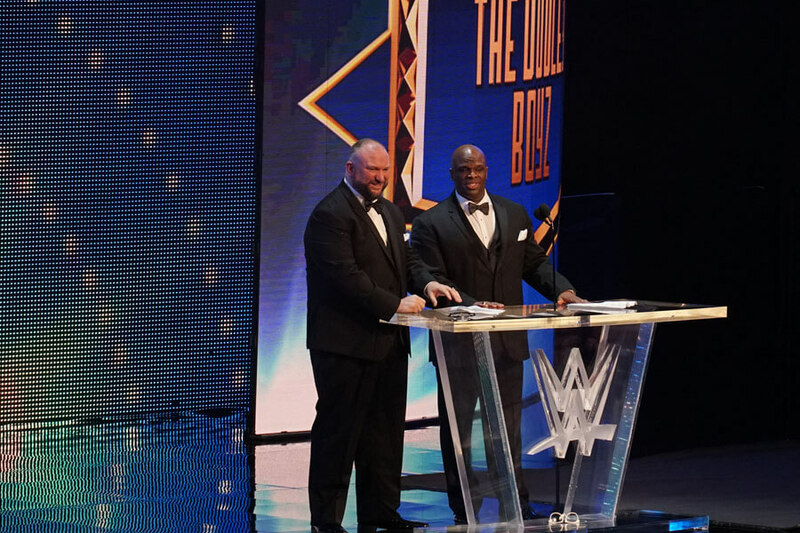 Individually, both wrestlers have been inducted into the Hall of Fame. As a team they might never get the ball based on how much time they spent in the NWO and WCW. Breaking on the to the WWE scene in 1974, “Luscious” Johnny and “Handsome” Jimmy made up the original flamboyant tag team. Known as the Valiant Brothers, they were ahead of their time with their bleach blonde hair and ringside swagger. The same year they entered the league they won the World Tag Team Title. For the next 370 days they successfully defended and held the honor. This was the longest in league history and would stand until Demolition took the throne in 1988. The Valiant Brothers were inducted into the WWE Hall of Fame in 1996. The British Bulldogs were made up of the Dynamite Kid, an aerial specialist, and Davey Boy Smith, a ground and pound technician. As a team, they did everything well, making them nearly impossible to defeat. The team’s biggest victory happened at Wrestlemania Two, where they took on Brutus Beefcake and Greg “The Hammer” Valentine to with the the World Tag Team Championship. Their style is legendary and many teams since have been influenced by them. Just look at how Enzo and Cass wrestle together and try and tell us you don’t shade of the British Bulldogs. Up ahead, find out who The Rock teamed up with to make this list! 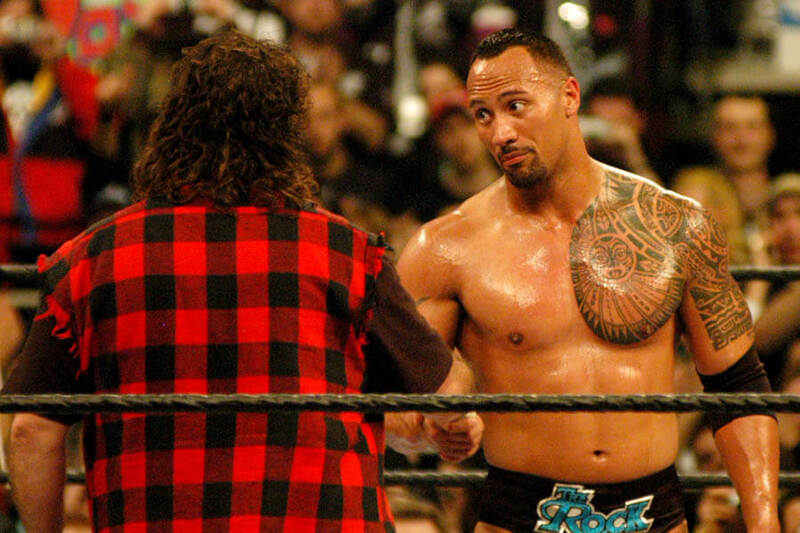 The Rock teaming up with Mankind to create the Rock ‘N Sock Connection was one of the strangest tag team duos in WWE history. The Rock and his perfectly sculpted body fighting alongside Manking, the schizophrenic mask wearing personality created by WWE Hall of Famer Mick Foley. Working together for two years, the Rock ‘N Sock Connection won three tag team titles and were, for a moment in time, the tag team gold standard for the WWE. In 2000, Foley retired and was named WWE Commissioner. The Rock took his ambitions to the silver screen and is now an action movie icon. Thrown out of the Undertaker’s Ministry stable in the ’90s, Farooq and Bradshaw banded together to form the Acolytes Protection Agency. Not only were they a formidable tag team in the ring, they offered their protective services to keep scared WWE stars safe for the night. To hire the APA, any wrestler would first have to find their disembodied door. Once found, they would have to offer beer and cash. With the transaction complete, the wrestler was safe for the night. In the coming years, the APA is expected to be inducted into the WWE Hall of Fame. D-Generation X was the brainchild of Shawn Michaels and Triple H. Two best friends who just wanted to have fun turned the tables on WWE and brought several wrestlers, including ones on this list, along for the ride. Amongst their most heinous crimes was putting their logo on Vince McMahon’s private jet. Forming in 1997, the team won their first tag team title in 2009. That didn’t matter them, though. Michaels and Triple H just wanted to have fun and burn bridges. During their initial eight-year run, no tag team defined the “Attitude Era” like D-Generation X. Few rivalries were as intense in the WWE as the one between brothers Undertaker and Kane. When the two evil forces saw eye to eye, they formed the Brothers of Destruction, striking fear into the entire WWE world. During their times of peace, the Brothers of Destruction took down tag team super powers Edge and Christian and KroniK. If they performed together more frequently they’d be higher on this list, but for the most part their hate for each other was stronger than their brotherly love. Just ahead, Shawn Michaels makes another appearance, but with who? The Rockers never won a tag team title, but still found a way to change the landscape of WWE tag team wrestling. In an era when Andre the Giants and Hulk Hogan reigned supreme, the undersized Rockers used aerial acrobatics to give them the upper hand in the ring. 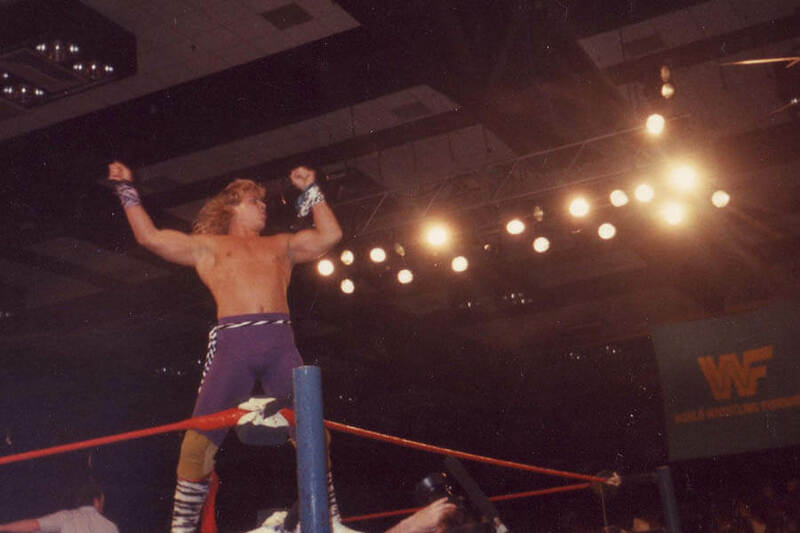 The partnership ended in 1992, when Hall of Famer Shawn Michaels picked up Marty Jannetty and threw him through the window of Brutus Beefcake’s barbershop. It is still to this day, one of the more memorable break ups in WWE tag team history. Team Lay-Cool might have been the most vicious tag team in WWE history. Notoriously nasty during the run, they once turned the WWE world against them after calling fellow diva Mickie James “Piggie James.” The insult broke James down to tear in middle of the ring. They weren’t just talk though. When another diva would step up for her fellow sisters, Michelle McCool would literally kick them back down, reminding of their place in the WWE Diva pecking order. Who knows what would have happened if they’d been given a chance to fight in the men’s division. The Wild Samoans had an interesting gimmick during their 21-year partnership. The team didn’t talk, instead preferring to grunt and having Captain Lou Albano translate for the crowd. It’s hard to believe they could get away with the same thing today, but during their two decades in the spotlight, crowds couldn’t get enough of it. To capture their 21 titles, the Wild Samoans used a brilliant strategy. They played dumb, allowing their opponents to come up with a strategy to beat them, then turning the tables, proving how savvy they really were. In 2007 the team was honored with their induction into the WWE Hall of Fame. Next, just how nasty were the Nasty Boys? The Nasty Boys were easily the grossest WWE heels of the ’90s. 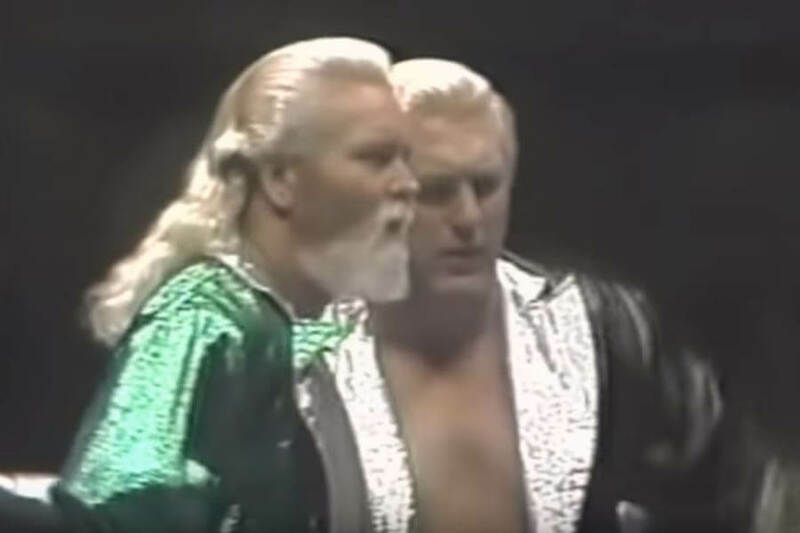 Proud of being toothless and uncivilized, Jerry Sags and Brian Knobbs pulled out all the stops in the ring, including rubbing opponents’ faces in their armpits. They rarely spoke whole sentences without cursing too. 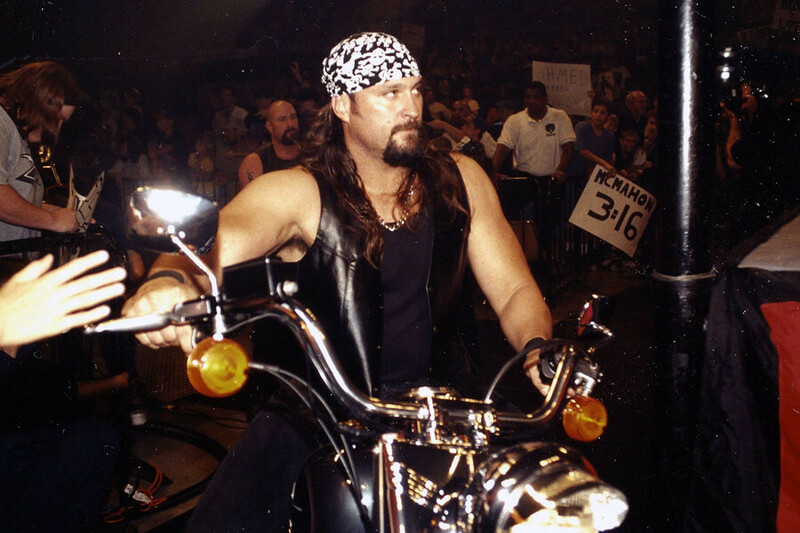 Brett Hart once described them as “bulls in a china shop…You didn’t know what they were going to come up with next.” Hart knew this from experience, watching helplessly one match when Sags took Hart’s motorcycle helmet and bashed it in to Jim Neidhart’s skull. Before John Cena saved the WWE, it was floating in uncertainty as the “Attitude Era” was coming to an end. Helping the league stay afloat was Los Guerreros. The uncle and nephew team of Eddie and Chavo Guerrero was a breathe of fresh air as nu-metal and potty humor became unbearable. Sadly, Los Guerreros never got to reach their full potential. Eddie was found unconscious in a hotel room in 2005. He was declared dead on the scene, with an autopsy later revealing he died of heart failure as the result of a previously undiagnosed condition. 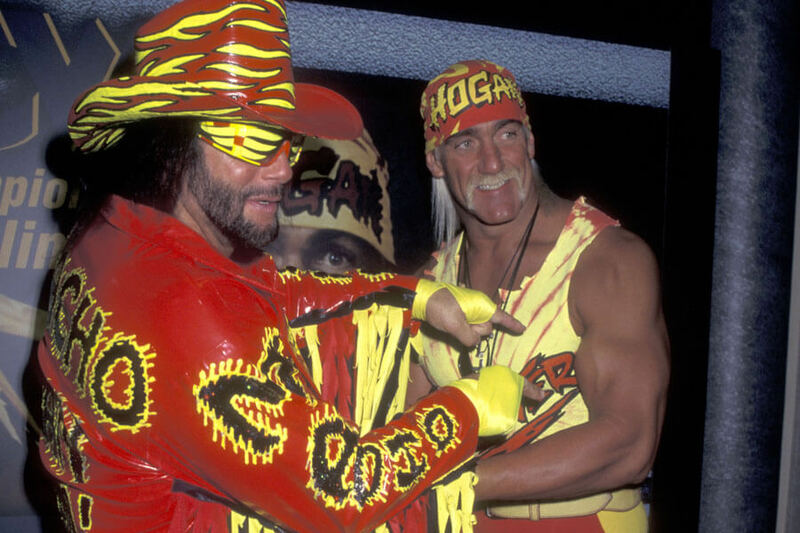 During the ’80s, the two biggest WWE stars were Hulk Hogan and Randy “Macho Man” Savage. When they decided to team up, fans went crazy. Then, when they won the tag team championship, fans didn’t think things could get better. Well, it turns out the fans were right. Shortly after taking over the WWE world, a woman split them apart. Randy Savage became enraged with jealousy when his valet, Elizabeth, and Hogan started getting close with each other. When Hogan rushed Elizabeth to the medical tent after being hurt during an event, Savage ended the partnership for good, creating a rivalry that would last for years.